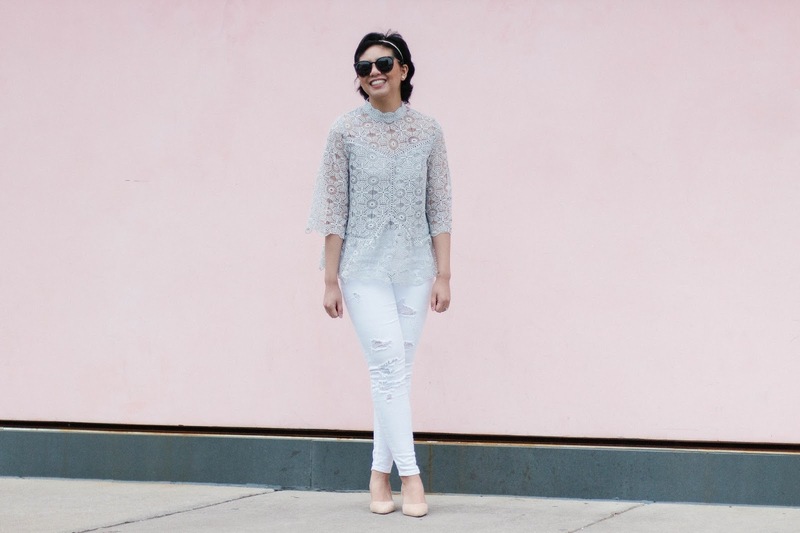 Something about wearing white distressed jeans and lace makes it so perfect for Spring. Combine those two pieces and to me they make a great Spring outfit! Without a doubt I would wear each piece separately all year round but together they make a darling transitional outfit as the weather slowly gets warmer. Yes, you heard me right and I do not follow the fashion rule about wearing white. I wear white after Labor Day. I even wore a monochromatic white outfit in the middle of Fall. I also think wearing white distressed jeans and a lace top is a great way to create a feminine outfit without having to wear a dress or skirt. As much as we all love Spring weather, we all know it is not perfect. In fact, the weather is a constant roller coaster. It can be sunny, mid-70’s, and the next day it would drop to rainy & cold, mid 40’s. No matter what the temperature may be during the Spring season, I still crave to wear those feminine pieces or outfits and I think lace and white jeans satisfy that. Can You Wear Mirrored Sunglasses In The Fall? Distressed denim is my jam! Loving that top on you! So chic! Loving that top on you! Beautiful top! It is the perfect spring color! Such a cute top! You can never go wrong with some adorable lace! Still so obsessed with this top! It is supposed to be headed my way, and I cannot wait. Love it with the white jeans. Have a wonderful weekend! I can't wait to see you wear it! I know you will love it! What a beautiful lace top! Gorgeous and so versatile. 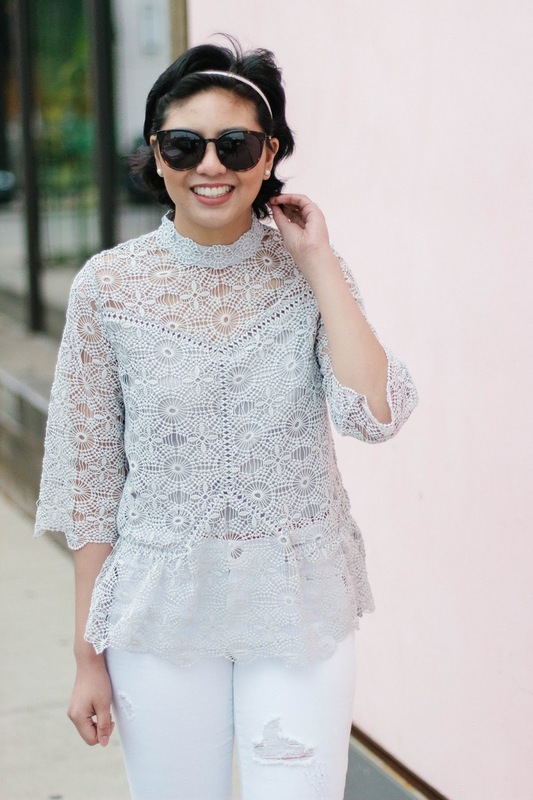 I absolutely love this lace top! So beautiful and suits you perfectly. All these are perfect! Certainly essentials for a ski adventure. I have these exact ON jeans and love them! 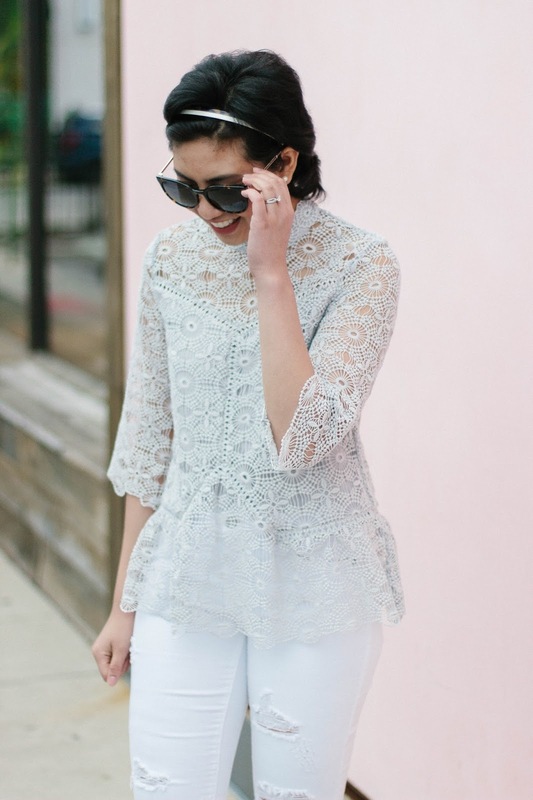 And I adore this pretty lace top – great post! that lace top is just so pretty on you! I like the delicate top! Great colour and design. Looking great and so stylish! Sweet look 😉 Enjoy the week-end! This is a beautiful top. Gorgeous color too! such a graceful outfit I love it! I use to not be a big fan of white jeans, but I found a pair that fits very well and now I absolutely love white jeans and wear them all the time. Love the your outfit so much. Finding the right pair makes such a big difference! Love this beautiful color combo. It's so perfect for spring. Love this top so much. You look perfect as usual Rach. Flawless look, babe! You look so beautiful! You’re looking so sweet in this outfit! Your Style is so perfect! You look so pretty!! I have this shirt too and it's one of my faves! That lace top is gorgeous! This lace top is incredibly stunning! So gorgeous girl! That lace top is so beautiful!! I love the mixture of the white distressed jeans with the lace top – it's such a beautiful and feminine look especially with the colours of the top! Hello! I’m Rach DiMare, and I am the girl behind RD’s Obsessions. Ever since I was a little girl, I had a love for creating outfits. Coming from a very large extended family, I always saw family parties as an opportunity to create and showcase my favorite fashion trend & outfit and became the family’s go-to fashionista. This blog contains affiliate links which may generate a revenue for the site when a purchase is made. I may occasionally provide links to other websites, however RD’s Obsessions is not responsible for the content or use of information on these websites. Any items gifted to me will be noted with “c/o” or “gifted”. My First Express Jeans Ever. Express Jeans Review. I'm 31! It's My Birthday! A Spring Transitional Outfit or Valentine's Day Outfit? Are You Ready To Put Away Your Summer Clothes? Is Pink Blush The New Neutral? Exclusive Lilla P Discount For My Readers Only! What I Move For. Top 5 Things That Drive Me Daily. Travel Guide to Quebec City. The Cutest Winter Getaway. Did the Polka Dot Trend Really Go Away? How Do You Know If A Blog is Successful? Two Year Cancerversary. My Life As A Cancer Survivor. The Value of Friendship. A Tribute to My Friends. The Simple Things in Life. What Makes Me Happy. Reflecting on 2017. Highlights and Lessons I Learned. When is The Best Time To Wear Odd Outfit Combinations? Blanket Scarves: All under $40! $300 Visa Gift Card Giveaway! What happened to the pink? Privacy SettingsPrivate Policy - This site uses functional cookies and external scripts to improve your experience. Private Policy - This site uses functional cookies and external scripts to improve your experience.